Elsewhere on GuitarFella we’ve reviewed the Yamaha CGX102, which proved a very good buy for beginners and intermediate players alike. 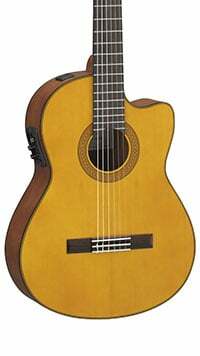 The electro-acoustic CGX122MSC is a step up in quality, materials and electronics, although – as it features in our chart on the best classical guitars under $500 – it comes in at a higher price tag. Worth the extra cash? Let’s check it out. As you may expect from a Yamaha that appears in the sub-$500 range, it looks very appealing and feels like a quality instrument as soon as you pick it up. With a 25.5” scale length, the CGX122MSC sports a familiar style, although features a small cutaway to allow easier access to the higher registers. One of the main selling points of this model is the use of solid Engelmann spruce on the top, matched with a nato back and sides, to offer the best of both worlds – sound and stability. 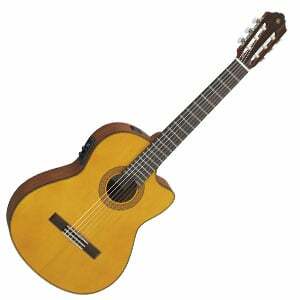 Note that you can also find a solid cedar-topped variation of this guitar. Another highlight is the satin-finished nato neck, which is a joy to play for guitarists of all levels. 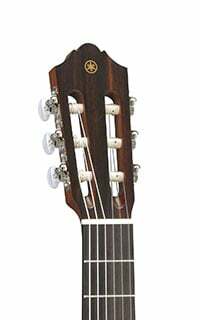 There’s a wide nut width, with generous string spacing, while the low action means it plays like butter. The neck is also home to a rosewood fretboard and 19 frets. Combine all this with the 12th fret cutaway and you have a neck that’s hard to fault. The hardware on the CGX122MSC allows the guitar’s natural characteristics shine through. This is most apparent with Yamaha’s excellent System 61 preamp and A.R.T. two-way pickup system, which offers professional-quality amplification and a natural tone. It also gives you plenty of power when it comes to sound shaping, with high, mid and low sliders, along with rotary controls for each of the pickups (there’s one on both the bass and treble sides of the guitar). There’s also an onboard tuner, which is always a handy addition. Elsewhere, the hardware is pretty standard, but complements the overall high-quality feel. You’ll find a good set of traditional open-gear tuners, a urea nut and saddle, and a rosewood bridge. Out of the box, the spruce and nato combine to deliver a well-balanced tone with great resonance and plenty of warmth. It’s also a pleasure to know that the tone will open and develop in warmth over time, thanks to the solid top. It’s a gift that keeps on giving! Through an amp, the warm tone remains natural, while the excellent controls allow you to shape the sound to match your style. Even though it pushes $500, the CGX122MSC remains a very affordable guitar and one that shows good value for the playability and sound on offer. It’s comfortable and forgiving for a beginner, but fast and stage-worthy for a professional, while the tone is beautiful both plugged and acoustically. A real winner from Yamaha. For more details regarding the Yamaha CGX122MSC, click here.